There is also a warning about dreaded ‘black ice’. ROAD USERS HAVE been warned to beware of ‘freezing fog’ on the country’s roads from this evening. Met Eireann is forcasting temperatures dropping to between -1C and -7C. It is thought this will cause a “major safety risk” for road users. The conditions are expected to last for the next few days. Freezing fog causes a reduction of visibility and this can lead to incidents escalating rapidly. A multiple-vehicle pile-up on roads with higher speeds such as motorways and dual carriageways. The organisation also warns pedestrians to avoid going out in heavy fog if they can avoid it and to beware of areas they would typically regard as safe. The RSA has also warned road users about the seasonal hazard of ‘black ice’. This is a natural phenomenon where a thin sheet of transparent ice covers a road or pathway. It can be particularly hazardous as it is hard to spot. The country is still reeling from the effects of Storm Rachel. As many as 8,000 Eircom customers are still without service today. A statement from the company this evening said as many as 1,700 customers had their service restored today, with more than 1,000 technicians out working to fix faults. “Our staff will work through the weekend throughout the country to restore service to as many customers as possible,” the statement read. Full service has been restored to all mobile sites impacted by yesterday’s storm. Additional reporting by Nicky Ryan. 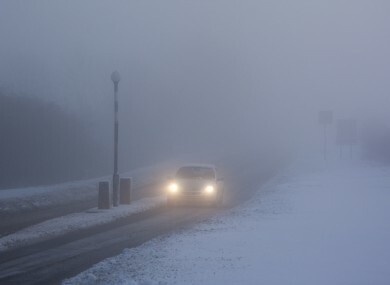 Email “Irish drivers could be facing their 'worst nightmare' as freezing fog set to hit”. Feedback on “Irish drivers could be facing their 'worst nightmare' as freezing fog set to hit”.